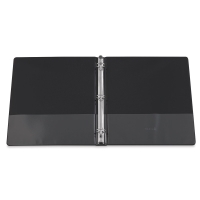 An indispensable tool for students, teachers, and presenters, these classic three-ring binders are an economical choice for presentation, organization, and storage. 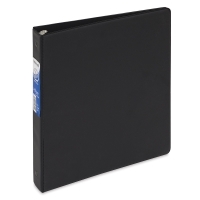 Made from polypropylene tightly sealed over rigid chipboard, Samsill Economy Round Ring View Binders have a clear overlay with a non-glare finish on the front cover, back cover, and spine, making it easy to customize presentations, projects, and reports. 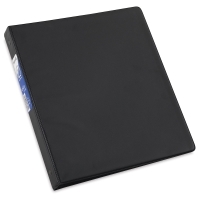 The polypropylene is also non-stick, preventing the transfer of ink from printed materials to both the clear cover and the inside of the binder. 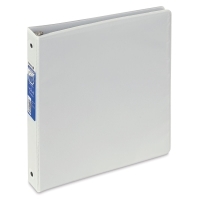 Three one-inch, spine-mounted round rings with double boosters hold up to 225 sheets (8½" × 11") with ease. 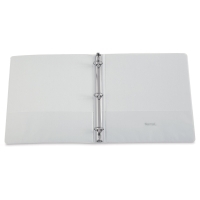 Two clear inside horizontal pockets provide additional storage for loose documents and non-punched papers. Each has enough space to hold notes, photos, business cards, or full-size pages that will be punched later. 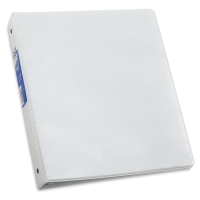 Available in Black and White, these PVC-free, acid-free binders are a great value for schools, offices, or even for managing documents at home. Use them in groups for different projects, timespans, or classes. The polypropylene in Samsill Economy Round Ring View Binders is 100% recycled, and contains a minimum of 75% post-consumer content. ® Samsill is a registered trademark.